When first planted, blueberries like daily watering for several days. 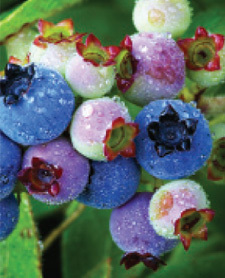 Blueberries prefer soil that is moist but not saturated. During the 1st year of your blueberry’s life, keep the area around the plant weeded to reduce competition for nutrients. Some gardeners remove the plant’s blossoms in the year it is planted, to encourage root growth rather than fruit production. After 1-2 years you can add compost, organic fertilizer without phosphorus, and/or pine-needle or other acid mulch around the plant. After 1-2 years, if your soil is not naturally acid, you can add sulphur or a blueberry soil amendment around the plant. Consider testing the pH of your soil. You do not need to prune your blueberry bush at planting time, other than removing damaged branches. However, after the plant is 5-7 years old, you can prune in January – March, when the plant is dormant. – Keep the bush fairly open. Open bushes promote better air circulation (less disease) and good light penetration to improve fruit bud set for next year’s crop. – After pruning, there generally should be an equal number of 1-, 2-, 3- , and 4-year-old canes. If you remove the oldest, unproductive canes, and thin to a few of the best shoots at the base (called “whips”), you will be renewing the bush each year.